Welcome! This is my fourth consecutive blog income report (December 2016 income report). I’ve been committed to this blog since 22nd July 2016 and I didn’t look back. Yet, the outcome is really astonishing. I’ve developed a self-esteem, which I never to have without blogging. I improved my English writing and speaking skills. I grew a self-discipline to goals, targets, and schedules. I became more familiar with setting marketing strategies and business plans. I see what you’re currently thinking about. Right, you should start up your own blog. I promise that it will be a huge transition in your life if you gave it a shot and started your own little corner on the internet. Not only will blogging help you to bring a side income to the table, but it will refresh the way you’re thinking about everything. Back to the lane; I’m here publishing my December 2016 income report. The last month of the year, and yet a great income and happy holidays with the family. This is another benefit of blogging; To stay with the family much more while income is being driven passively into your bank account. I didn’t work much during December 2016, I wasn’t so slammed like how I was last month. I came up with better ideas for this blog. I even brought this blog on the edge doing some crucial SEO tweaks that could have demolished my rankings so far. Basically, I spent much of the time this month seeking smarter ways to develop this blog. Before heading off with December 2016 income report statistics and plans, let me go over a few questions you probably have in mind. If you’re new here, make sure to read the following answers to get an idea why we’re disclosing such private blog income report like this. What is Blog Income Report? We’re delivering a monthly income report for all the profits and expenses generated for this blog. We’re having multiple income streams from different online business models, but here we will be only covering income from this blog GrowCheap. Why we’re writing Income Reports? Some of you may see it weird enough. Why are we sharing such private income reports? I agree with you that it’s a little bit weird! Yet, It’s very informational and inspiring for others. It may help you as well as tons of others to start and grow a profitable blogging career. The idea behind publishing our income reports is to share detailed insights about how to make money blogging. We’ll be going over every single cent generated from this blog and show you how we managed to earn it. Because we do seriously care, we not only want to deliver insights about blogging via blog posts, but also to show you where the money is. We’re simply going over how possible it is for you to do the same or even better to make a monthly passive income right from your online blog. Is it completely Passive Income? Although we call it monthly passive income, it still requires hard work and patience to generate a sustainable income out of your online blog. I would like to go over the difference between Freelance Income and Passive Income. Freelance Income: If you’re working as a freelancer, then you’re trading hours for money. For example, if you’re doing a website design for a client, you’re here exerting efforts and giving time to this website project and in return the client will pay the agreed amount of money. Passive Income: You still need to exert efforts, but here you’re putting in efforts prior to making real money out of it initially. For example, in blogging you’re starting a blog, writing blog posts, and do marketing. Later on, you will reap the benefits and start making real money out of it. Don’t worry if you didn’t get it clear yet. Keep reading and I’m sure you will catch the idea in a way or another. If you’re serious about blogging, I would strongly recommend subscribing to our mailing list to keep track on how we’re making money online via this little blog. Hmm. One more month with a low disappointing traffic. But by looking to the bright side, We’ve made $1,522.92 as a net profit from this blog in a month. I hear you, making money is the most important here! I’m sorry to say that you’re wrong. Building traffic is way important as it will guarantee a monthly passive income flow on the long run. I’ve leveraged my web design experiences and acquired a couple of clients to help them with their websites coding and stuff. I also worked a side by side with newbie bloggers to help them getting started with their blogging careers. That’s exactly how I made that income you see above. While I love all that, I didn’t like the idea to be included personally in the process. We started this blog – kind of – to run a completely passive income. An income that could be driven into my bank account without personally being around. Do not wonder, That’s seriously possible! I spent November and December 2016 working (personally) with clients and newbie bloggers to help them with their websites designs. It was so much fun, but I was questioning myself: how many clients I can work with every month in best cases? what if I got sick? How much money can I gain freelancing my services? what if I had to travel on a vacation? The answer is that my income will significantly drop. I have to be always close to my laptop in order to keep the money flowing this way. I’ve to always mine for clients and search for leads to keep that income rolling. So I decided to reinvent the wheel here. I won’t be there searching for potential customers to buy my services or to use my affiliate links. I will let them search for me instead. I will work smarter on my blog here instead of working for others prosperities. Optimize for search engines and get found ORGANICALLY. Reach 100,000 social media followers (combined). Generate $10k monthly income PASSIVELY. Well. I mentioned earlier that there is nothing called passive income. And I still believe in that. What I meant above is that instead of working for clients one by one, I will work exclusively on this blog. I will invest my hard work to deliver useful content that drives traffic to my site. Building traffic and building a mailing list is the key for a successful passive blogging career. For example, I will work hard for a post like this and make sure it delivers a helpful information to the reader. And accordingly, my affiliate link there will work passively for me. There is no magic here. It’s all about mapping a strategy and working for it. You’re a web design freelancer trading hours for dollars. Each of them will pay you $1,000. – $5,000 Income for that month. – You’ll be fully committed to complete the work with no free time. – One time payment for that month. – Maximum Number of clients is 10 for $10,000? You’ve got a busy blog with lots of traffic. You’re enrolled in a couple of highly paying affiliate programs. And you’ve got your own product. – You’ve made 25 affiliate sales ( $50 per sale ). – You’ve made 25 product sales ( $50 per sale ). – You’ve earned $2,500 in sales. – You still got free time since it ran passively. – The same income potential – or even higher – for next months. – There’s no cap for maximum sales. Although the first example is showing more money, I would prefer to be the second example. And this is what I mean by starting up and growing a passive profitable blog. Which example you prefer to work for? Do you need more encouragement to help you getting started? I’ve improved my “Ultimate Guide to Start a Blog” with new details, pictures, and screen snapshots to make it as easy as 1,2,3 to start a profitable blog. SHOW ME HOW TO START A BLOG NOW! That was my December 2016 income report. It’s time to put promises and set up goals for January 2017. It will be a part of the main 2017 goals I’ve set above. I will make sure to focus on SEO and get found organically via search engines. I believe that the income for this month will significantly drop but it will pay off on the long run. The best thing that I will work hard for is to turn this little blog into a passive income machine. This means that I will work harder for content and do my best to deliver what you seriously need to read about. More commenting on other blogs. Finalize and publish my premium eBook. Increase Email subscribers from 301 to 650. Double Facebook Followers from 1,786 to 3,000. Increase Twitter Followers from 468 to 3,000. Boost Pinterest Followers from 786 to 3,000. You read it right. We’ve got our first interview ever. It was seriously surprising for us. We’ve interviewed to what we’re doing here on this blog. Although it was a text interview (not a voice one), I believe we expressed all we wanted the world to know about us and what we do. The interview was hosted and published by Chantel Arnett from Blogging With a Smile. So big thanks to you Chantel, that was a nice exposure chance to have. I would personally invite you to read the full interview and let me know what you think about it. Thanks for sticking by until right here. It’s always an amazing feeling to share with you what works and how to leverage up you blog income too. I’m trying to be as transparent as I can. But if you’ve got any questions or inquiries, Please let me know in the comments section below. I will be very happy to address them. One last thing to tell you: I’ve renovated my step-by-step guide to starting your blog with more details and screen snapshots to make it as easy as possible for you to follow. You don’t have to have any technical knowledge to get started. It’s way easier than you may think it is. I’m looking forward to hearing back from you regarding December 2016 income report. We would love to know what you think about it. If you find this post useful, do not forget to share our December 2016 income report with your friends on Facebook, Twitter, Pinterest, and Google+. Thanks for your support! Really amazing for what you’ve got from this blog with only 1,200 pv/month. Keep up the great works,.. Very inspiring, thanks for sharing this karim, I am very interested reading stuff like this. Keep it up. With only about 70 posts and working regularly after August, 2016 your earning is pretty cool. Last time when I visit your blog I found it very informative. Now I want to ask you one question. Your traffic is 1200/month and you made more than $1000, how you manage to get such amount. I am also getting 2000+ traffic but I have not earned single bucks from my blog. Can you please guide me. Any help will be really appreciated. Make sure you read my blog post carefully, as I made sure to include how I could receive such earnings. I’m – very soon – will be publishing my A-Z Blogging eBook. 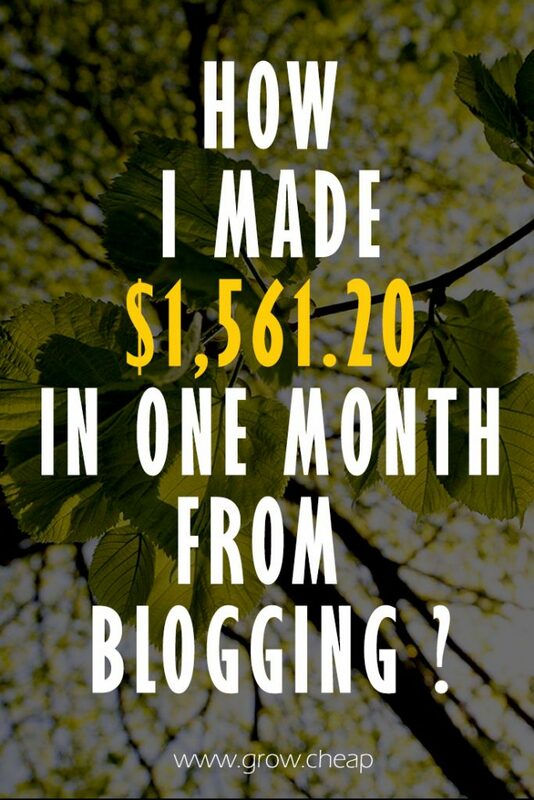 I made sure to include and report all my steps along the blogging journey from $0 to $1,000 per month. Please make sure to subscribe to the mailing list to get notified when it’s published. Like I mentioned in the article, It’s all about helping others with their struggles. Blogging is not about writing articles but mainly about helping other people on what they need and get them accomplish. I read your post my mail. You got a big big income from your blog. I got inspired from reading your post. Please give me instructions for better blogging. I am your regular visitors. I’m so glad that you got inspired, and I’m sure you’ll be doing even better with your blog very soon. I always wish you all the best. Furthermore, I’m – very soon – will be publishing my A-Z Blogging eBook. I made sure to include and report all my steps along the blogging journey from $0 to $1,000 per month. Please make sure to subscribe to the mailing list to get notified when it’s published. And I again wish you all the best.